What if I told you that you could boost employee engagement, reduce turnover and increase profits simply by flipping a switch? You’d do it, right? Wouldn’t everyone? Employee engagement is a hot topic, and for good reason. Low-engaged employees are costing companies between $450 and $550 billion dollars annually! While there is no switch that can be flipped that will instantly turn those frowns of disengaged employees upside down, there are plenty of budget-friendly, cost efficient tips that companies can use to get a handle on their employee engagement. If there is only one tip you read from this whole list, let it be this one. Understanding the people with whom you spend 40+ hours a week is the crucial first piece to the employee engagement puzzle. If you don’t know anything about the person working alongside you, how are you expected to know what motivates, excites and makes them happy? Spend time having one-on-one conversations on a weekly basis; engage them during happy hours, or use fun personality tests to really get to know each other. You’ll be a better leader, friend, mentor and employer for it. Once you know more about your employees and colleagues, you’ll know how they like to be recognized! Maybe a huge office-wide shout out for a job well done is enough to excite an employee, but maybe it isn’t. Not everyone loves being the center of attention, and some employees would simply prefer a quiet and genuine ‘thank you’ in passing. Others may love the timeless act of a handwritten thank you card. Regardless of the method that is used to do it, recognize your employees for a job well done. Oh, and studies have shown that positive reinforcement, rather than negative, plays a huge role in boosting employee engagement, so remember this during your next annual review. Communication is extraordinarily important in so many different ways. It’s how we as humans learn, interact, develop and express ourselves. No one wants to work for a company that doesn’t communicate openly and effectively. Commit to a communication overhaul at your company, and start talking, texting or emailing with your employees on things that are pertinent to their satisfaction. Studies show that inefficient and poor communication is one of the number one causes of low engagement among the workforce. Nothing wreaks havoc on engagement quite like stress. While there are plenty of reasons someone could be dealing with stress (perhaps some of which you as an employer, can’t control), you should know that a major cause of stress in the workplace is a lack of teamwork. It leads to feeling overwhelmed and/or working overtime, both of which will intensify any existing feelings of disengagement. Try divvying up a project among a team, assign multiple people to one task and foster a culture of collaboration and teamwork. Before you go rolling your eyes at the thought of having a staff that makes their own schedules and takes meetings from their sofas at home, just note that a lack of flextime and telecommuting are among the top reasons that millennials and gen X employees aren’t actively engaged at work. Add in the fact that these two generations account for more than 65 percent of the current workforce and I’d say it’s time to start reconsidering your flextime benefits. Look at it from this perspective: the second you start allowing flextime and telecommuting at your company is the second you open up any available positions to anyone in the world! Adios to the days in which jobs were filled locally or even regionally as employees had to report to a physical office to do their jobs. With telecommuting options, you can open any available position to anyone in the world! Plus, it doesn’t hurt that you’ll be able to attract top talent by offering with this benefit as well. What are you waiting for? Flip that employee engagement switch by implementing any (or all!) of these tips. Do you have any other ideas for engaging employees? Share your thoughts in our comment section below! 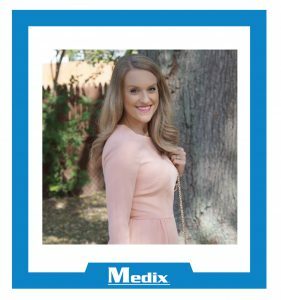 Jessica is Employee Engagement & Special Projects Manager at Medix and currently works out of our Chicago office. This entry was posted in Clients and tagged corporate culture, employee engagement, Employee Recognition, flexhours, flextime, hr technology, sms systems, talent innovation, text messaging. Bookmark the permalink. ← Your Job Interview is Going Great! Now, How Do You Mention Your Vacation?